Professor of Classical Languages Winifred Weter taught at Seattle Pacific College from 1935 to 1975. I’d say Winifred Weter, classical languages professor — graduated from the University of Chicago in 1933 as I remember. Her dad was part of the leading law firm in Seattle; the family financed the library and she had a habit of handing back her paycheck. That’s the reason I had a Greek class or two from her where I was the only student enrolled. She told me of her arrival at SPC and her first year or so teaching a girl’s PE class so she could build another class, a classical languages department, which she certainly did. The picture is of Winifred Weter in whose Classical Greek class I met my future husband, David Paine ’65 (although I did not know that then). We always can recognize Dr. Weter’s easy smile. I believe this woman is my great-cousin (my grandma’s cousin) Winifred Weter, whom I was privileged to know at a few larger family gatherings growing up. When I attended her funeral a few years ago I was impressed to learn of her life’s work teaching classics at SPU and her support of various causes to make the world a better place. I’m not an SPU alum, but my husband, Scott Waeschle ’03, received his master’s degree in education there, and I always enjoy reading Response. The professor is Dr. Winifred E. Weter, professor of Greek. Absolutely one of my all-time favorite teachers, and the person who so inspired me that I went on to graduate school and taught New Testament Greek for many years, beginning in 1971 and retiring in 2012. What a GREAT lady, and truly God’s gift to SPU. I recognize that photo. It’s Dr. Winifred Weter. As a religion major, I studied Greek under her tutelage. One time in class she gave us an assignment. “It’s time that we begin communicating in Greek on campus,” she said. “Compose at least one sentence, and to everyone you meet on campus from this class, speak your sentence to them.” Now, of course, a subject and a verb comprise a sentence. I came up with “ouk oida.” Whenever I met a Greek classmate, that was my sentence. Then I chanced to meet Dr. Weter herself on the sidewalk and she looked at me expectantly. “Ouk oida,” I said. Wow, did I get a free lecture. She was both amused and fussed at me. “Oida” means “I know.” “Ouk” is a negative word. Thus my sentence was translated, “I don’t know!” Dr. Weter thought I could do better than that, but we parted with smiles. As a SPC student from the fall of 1951 to graduation in 1955, I recognize the “A Young Lady with a Brand New Unused PhD” as the classic language professor, Dr. Winifred Weter. But of course I never saw her looking like this, nor did I ever have one of her classes. Dr. Winifred Weter is the person on page 52. She was my Greek professor, a wonderful teacher and sooooo dedicated. No one better. Exceptional in every way. The woman in Summer Response 2014 is Dr. Winifred Weter. I took Latin from her and remember how she used to have a big smile while describing gory Roman battles. Latin, I understood. The smile? I never had the nerve to ask! How could anyone who ever knew her forget her?? What a grand lady. Her name is Dr. Winifred Weter. She taught classical language at SPU for many years. Latin and Greek were specialties. I took a condensed course in New Testament Greek from her, but everyone who went to SPU while she was on faculty knew who the incredible lady was. Her coaching was before my time (a guess would be women’s basketball), but not her classical language. Her life touched thousands of students in one way or another but she never, ever tried to push herself into the limelight. She was just there, for all of us. She also visited my wife, Carmena French Capp ’51, and I while we were involved in The Evangelical Seminary of Southern Africa. When I looked at page 52 of the Summer Response, I immediately recognized the youthful Winifred Weter. 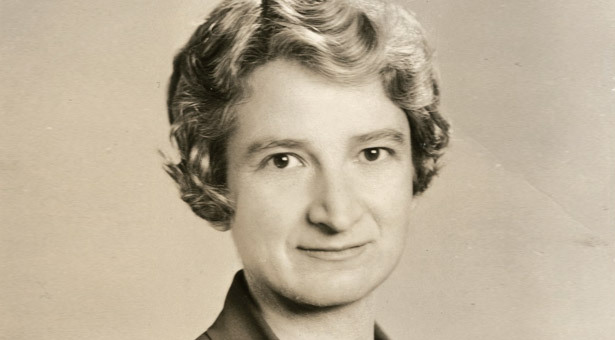 When I attended Seattle Pacific 1957–1961, she had white hair but the same smile and the same fantastic brain. The picture in “From the Archives” has to be Dr. Winifred Weter. She used to chuckle when she read my very literal translations in her Latin class when I was a freshman at SPU.